“The mail must go through!” That was their motto and for the most part that’s the way things were. Pony Express riders and station managers braved not only tough weather, but also unfriendly Indians and bandits. So how did the Pony Express come about? Why was it so short lived, having only lasted a year and a half? And even better yet…What was the Pony Express?! In 1848 the discovery of gold in California brought thousands to the West Coast. People flocked from all over the world, eager to make their fortune. But postal service was primitive. One could send a letter via stagecoach, ship or by stranger (with the latter you would cross your fingers and hope the letter got to its destination). By coach the letter would usually take about a month to get the receiver. Coaches traveled from Missouri to California and vise versa, on a nearly 1800 mile trek through the South and southwestern territories. Many argued that a northern route would be quicker, but Southern senators responded by saying the mountains were impassable in the winter. Still the mail was moving. William Russell was the brains behind the Pony Express. He managed to convince his partners, Alexander Majors and William Waddell to go through with the idea, although frankly they thought it impossible. Much of the public thought him insane. How was one to get the mail from Missouri to California in 10 days? Despite criticism Russell, as he himself stated, was determined to create the Pony Express. Although he was unable to secure a government subsidy, the trio established the Pony Express. They began building relay stations, set up at 15 miles apart, from St. Joseph, MO to Sacramento, CA. Stations were mostly hastily built . Some were wood, others sod or adobes. Occasionally a cave also served as a station. At each station a rider would receive a fresh mount and carry the mail for approximately 100 miles before being relieved by another rider. It continued in this manner until the Eastbound mail arrived east and the Westbound mail arrived west (for obvious reasons of course). The riders are mostly youths, mounted upon active and lithe Indian nags. They ride 100 miles at a time—about eight per hour—with four changes of horses, and return to their stations the next day. I, … , do hereby swear, before the Great and Living God, that during my engagement, and while I am an employee of Russell, Majors, and Waddell, I will, under no circumstances, use profane language, that I will drink no intoxicating liquors, that I will not quarrel or fight with any other employee of the firm, and that in every respect I will conduct myself honestly, be faithful to my duties, and so direct all my acts as to win the confidence of my employers, so help me God. In addition to that each employee was provided with a Bible. A former sailor William Richardson is believed to have been the Pony Express’ first rider.The Pony Express mail arrived late causing a couple of hours delay. Finally Richardson was off. The mochilla, used to carry the mail in, he had carried out of St. Joseph arrived in Sacramento on April 14th where the rider, William Hamilton, was received with much fanfare. After a celebration in San Fransisco the mail was brought to Sacramento via the Antelope. William Hamilton waited in the rain as the mail was locked away in his mochilla by a Pony Express representative. Mounting up on his horse, he was soon off. The Eastbound run would prove troublesome for most riders, as treacherous weather chased riders. Hamilton’s relay rider, Warren Upson, was caught in a blizzard. All along the trail riders experienced some obstacle that caused the mail to fall far behind schedule. Fortunately, other riders were able to makeup for lost time. On April 13th the Eastbound mail arrived in St. Joseph, carried by William Richardson. Skeptics were forced to eat their words as the popular Pony Express continued the runs. Pony Express Rider Jack Keetly:We rode into the office and put on the mail, which consisted of four small leather sacks six by twelve inches, fastened on to a square macheir which was put over the saddle. The sacks were locked with little brass locks much like one sees to-day on dog collars, and the sacks were sewed to the macheir, one in front and one behind each leg of the rider. When the mail was put on, and the rider mounted on his race horse, which was always used out of St. Joe to the Troy Station, nine miles from Ellwood, he bounded out of the office door and down the hill at full speed, when the cannon was fired again to let the boat know that the pony had started, and it was then that all St. Joe, great and small, were on the sidewalks to see the pony go by, and particularly so on the route that they knew the pony was sure to take. While much of the living conditions were rather primitive at stations, ponies got the ‘royal treatment’. Riders were continuously putting their lives in danger. Rider Nick Wilson tried to save his pony after Paiutes made off with it. Wilson was shot, having an arrow firmly embedded in his forehead. When he was found he was given up for dead and his friends left to alert others of the Paiute raids. Later, when they returned, they found Wilson was still alive, although barely. He went on to live, but he would wear a hat the rest of his life to hide the scar, a symbol of the dangers the riders braved. When three drifters, who had recently turned up at Williams Station, kidnapped three Paiute women trouble began to brew. One of the women got away to tell the chief that his wife had been kidnapped. The chief demanded the drifters free the women, but they flatly refused, provoking the chief’s wrath. The chief enlisted the aid of another chief who hated white. When all was said and done the three drifters as well as two of the stations hands were dead. The station manger J.O. 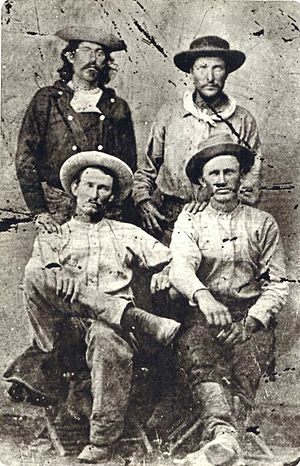 Williams, who had been away, found the station burned to the ground, his two brothers dead (they were the station hands) and the horses stolen. Following this a militia was formed and a battle ensued between the Paiutes and whites. At Buckland’s Station Bob Haslam’s relay rider flatly refused to go through having heard of the Williams Station Massacre. Bob Haslam had just finished his run, but agreed to take the mochilla through. Having delivered the mail he headed back to Buckland’s. On the way he found the Cold Spring’s Station in ruins and the manager dead. The Indians had stolen the horses and he was forced to push on without having a fresh mount. Bob Haslam: I watered my horse — having ridden him thirty miles on time, he was pretty tired — and started for Sand Springs, thirty-seven miles away. It was growing dark, and my road lay through heavy sage-brush, high enough in some places to conceal a horse. I kept a bright lookout, and closely watched every motion of my poor horse’s ears, which is a signal for danger in an Indian country. I was prepared for a fight, but the stillness of the night and the howling of the wolves and coyotes made cold chills run through me at times, but I reached Sand Springs in safety and reported what had happened. He did finally make it to back to Buckland’s, having made a round trip of 380 miles. This is the longest trip on record. For his bravery he received a $100 bonus. Because of the frequent attacks the Pony Express was forced to stop sending the mail through from May to June in 1860. 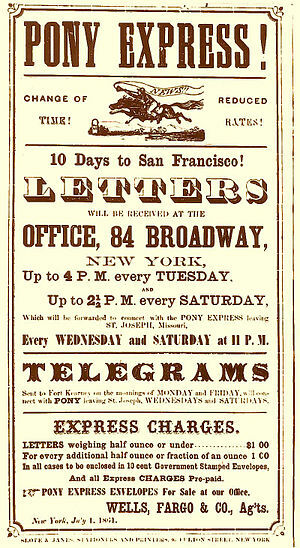 A monumental achievement by the Pony Express was the delivery of Abraham Lincoln’s inaugural speech, which the Express delivered to the West Coast. A fast and faithful friend has the pony been to our far off state. Summer and winter, storm and shine, day and night, he has traveled like a weaver’s shuttle back and forth ’till now his work is done. Goodbye, Pony! You have served us well. Help Wanted. Orphans Preferred–I love it. It certainly was risky business. That poster has become an icon of the Pony Express. 5 stars – A really wonderful article! I enjoyed reading it very much. Keep up the good work! Excellent article – what a risky venture, no wonder orphans were preferred. But what stories they must have had to tell later in life. Yes, their stories are interesting. The things they went through could fill a book for ‘each’ rider. I think, so far, the most fascinating would have to be ‘Pony Bob’ Haslam. In these modern times, it’s hard to fathom that something as simple as delivering the mail could be so difficult. I really feel lucky to be living in these times. Yes it is. The world seems so much smaller than what it was in previous decades. The Pony Express riders put their lives on the line to get the mail through. Almost awing how much more easy the postal service operates nowadays. It’s a shame the Indians had to be feared! I realize not all tribes were killers, but enough were. Very true. And sometimes when it was a peaceable tribe, settlers treated the Indians wrong. A vicious circle. Thanks for your comment! Excellent post! My how things have changed with the mail!! I loved the 10 days to San Francisco! However, they truly did risk their life to deliver mail. Thank you! Yes so many risks. Can you imagine the grit those riders had to brave all of the odds? Thank you for your comment. Can any of us imagine waiting 10 days, let alone a month, for news and letters? I thought that the Pony Express stopped because telegraphs, then railroads allowed for information to be carried more efficiently. I had a distant relative who was one of the riders, at least according to family legend. I think quite a few people of today would grow frustrated if they had to wait so long for correspondence. Phones and emails allow for instantaneous communication – with that in mind can you imagine how people who implemented the Pony Express for the transportation of their letters would think of today’s communication? !